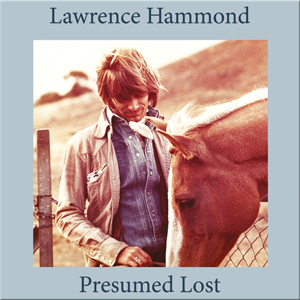 Shagrat Records is honoured to release Lawrence Hammond’s second and until now unissued solo LP, Presumed Lost. Those of you who bought last year’s Mad River archive set Jersey Sloo will know that after the band split up, singer, bassist, guitarist and song writer Hammond embarked on a solo career in the 70s that saw him pursue a rootsier path, one that revealed his deep love of country and blue grass music. Lawrence released one fine solo LP called Coyote’s Dream on the Takoma label and gigged regularly with his backing outfit, the Whiplash Band. Though sales of the Takoma release were disappointing, he did begin work on a second solo set finishing it in 1981 whilst in med school. The tapes were subsequently lost for well over a decade but have been finally rediscovered and restored for release some 35 years after they were first recorded. Using many of the musicians that made Coyote’s Dream such a joy, including lead guitarist James Louis Parber, fiddle player Byron Berline, Alan Lane on bass, Bill Weingarden on pedal steel, and featuring Lawrence on lead vocals, acoustic and acoustic lead guitars, dobro, mandolin and viola, Presumed Lost sees the Hammond come of age as one of American music’s great story-tellers. Packed full of his eloquent tales of hardship, love and death, and occasional flashes of real humour (‘The Heavenly Saga of Flight 641’), Presumed Lost is a treat from start to finish. 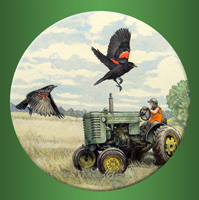 In amongst the country ballads and road songs that ooze with gritty realism and conjure up utterly believable characters and situations from the American heartland, are such gems as the enchanting ‘Papa Redwing Blackbird’ with its glorious soaring flute and classic West Coast harmony vocals, and the dark, almost sinister ‘Love for the Hunter’. Arguably though, the centrepiece of the record is the epic ‘West Texas Border Patrol’, a story of heart-rending tragedy and broken friendship set against the majestic backdrop of the Rio Grande, crammed full of startling cinematic images, and brought to life by a sparse musical soundtrack that puts one in mind of the melancholic grandeur of Procul Harum at their late 60s best. And on this outing, Lawrence has finally got to air his own version of ‘John Deere Tractor’, a song he wrote way back when, which has been recorded by many over the ensuing decades including Jerry Corbitt, Larry Sparks, and of course The Judds, who enjoyed a huge hit with it. Presumed Lost : released 16th November 2012 as a limited edition CD with 16 page booklet containing comprehensive sleeve notes and many rare photos from the era. Vinyl junkies : The VERY limited vinyl edition of 'Presumed Lost' is now available here ! "Hammond's unheralded Bay Area band, Mad River, blurred traditional American music with blazing psychedelic twin guitars. Now an unreleased, cautiously unconventional 1977 solo album emerges, blinking. Only West Texas Border Patrol builds on Mad River's expansive blueprint, but the other songs are all tiny, shiny country-rock period pieces. ‘John Deere Tractor’ was a 1980s hit for The Judds; Hammond, now a medic on a Native American reservation ... heard it on the radio ... never looked back." "A friend has mailed me the new CD "Presumed Lost" from North America. This is a lovely record, very handsome packaging too by Shagrat Records. The singing and musicianship seems top-flight and the songs are just so original. Well. I recommend this one everybody!" After Berkeley psych legends Mad River greeted the wold with scorching tear-ups such as Amphetamine Gazelle in 1968, singer Lawrence Hammond reignited his love affair with country music. The yearning title track to the group's 1969 Paradise Bar And Grill LP pointed towards the path Hammond would traverse when the group split shortly after its release. Ater tasting unexpected success when his song John Deere Tractor hit big for The Judds, Hammond formed The Whiplash Band in the early 70s, releasing Coyote's Dream on Takoma in 1976. The album sank and Hammond started training to become a doctor, leaving the follow-up they'd struggled to complete in the vaults for decades. Hammond still pursues his medical work for the underprivileged, but sterling efforts by Shagrat's Nigel Cross have resulted in a beguiling follow-up to the 2011 release of Mad River's Jersey Sloo. Sublimely framed by stellar musicians including fiddler Byron Berline, guitarist James Parber and pedal steel maestro Bill Weingarden, Hammond's disarmingly pure but impassioned voice elevates poignant cowboy ballads such as Pale Moon on the Pecos, Papa Redwing Blackbird and epic West Texas Border Patrol. His own take on John Deere Tractor and a humourous Jesus-freak outing The Heavenly Saga of Flight 641 add balance. With Shagrat's usual exhaustive annotation, this little beauty becomes both a fascinating archaeological artefact and timeless classic from a lost world.